Acute kidney injury (AKI) has been implicated as an independent risk factor for the development of CKD in recent observational studies. The presumption in the nephrology community is that this association represents a causal relationship. However, because of potential problems related to residual confounding (shared risk factors), ascertainment bias (sicker patients have more follow-up assessments), misclassification of exposure (problems with defining baseline kidney function and AKI representing a discrete event versus progression of renal disease), and misclassification of outcome (de novo CKD versus CKD progression), it is difficult to conclude with certainty that AKI is truly causal for CKD. In this review we highlight several of the Hill causality criteria to examine the existing evidence and point out the missing elements that preclude defining AKI as a cause of CKD in the general population. Only well-designed studies with rigorous assessment of kidney function in all participants (AKI and non-AKI) before and after the episode or hospitalization or randomized, controlled trials demonstrating that prevention or treatment of AKI reduces the incidence of subsequent CKD can clarify the causal nature of the AKI-CKD relationship. The incidence of acute kidney injury (AKI) is on the rise.1 Approximately 600,000 cases of AKI are reported each year in the United States. Even though most cases of AKI are reversible within weeks of occurrence, with full recovery to baseline, data from recent observational studies suggest an association between AKI and subsequent CKD.2 In fact, the increasing incidence of AKI is suggested as an explanation for the increasing burden of CKD and ESRD.3 However, although AKI and CKD are frequently linked in epidemiologic studies, the evidence to date is entirely observational and precludes definitive causal inferences.4,5 Until causality can be clearly proven in nonobservational studies, such as randomized, controlled trials (RCTs), the observed AKI-CKD associations should be considered noncausal as long as they are based on epidemiologic or observational studies. 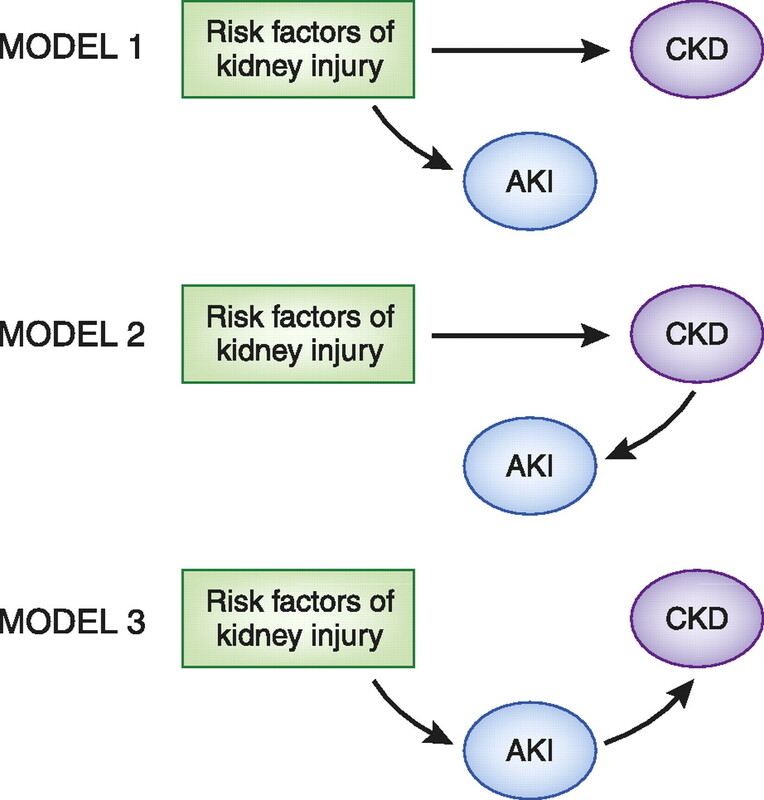 Three hypothetical causal models of the AKI-CKD association. Clearly, many of the events and risk factors that precede the development of CKD are the same as those that predispose to AKI. Despite this, even in the laboratory setting it is difficult to find good analogues to human AKI.11 Although AKI may precede CKD in humans, it is harder to show this relationship in animal models;12,13 in fact, ischemic preconditioning may partially protect against future injury,14 suggesting this traditional observational association may not be causal in nature. Hence, the scientific evidence to prove the unidirectional causality of the hypothesis that AKI causes CKD in humans is widely missing at this time. The biologically plausible model would require that healthy individuals sustain substantial kidney damage or loss, followed by immediate recovery and long-term follow-up to examine whether there would eventually be any evidence of chronically sustained disorders of kidney structure or function. It is also important to note that the putative associative models in Figure 1 may overlap, so that a combination of these associations may be present in a given case. In real-world scenarios, only 8.5% of patients with AKI are referred to a nephrologist for outpatient follow-up.15 Thus, cases of AKI may be superimposed on a pre-existing and previously unrecognized CKD, and these so-called acute-on-chronic events, even after the return of kidney function to baseline, may appear to have left sequelae, especially if the status of kidney function before the AKI was not fully evaluated. Such a misleading observation can leave the impression that AKI is not fully resolved and that it has led to incident CKD. In another scenario, risk factors of the kidney injury that had engendered an AKI event may persist and eventually lead to future CKD without any direct causal association between the past AKI and subsequent CKD (see model 1 in Figure 1). There are many examples of such a noncausal association between an acute event and subsequent chronic disease states. A useful analogy to consider would be the epidemiologic link between preeclampsia and future CKD and ESRD.16 Pregnancy is a more discrete event and is easier to identify than the stressors that lead to AKI; in addition, preeclampsia in women with access to prenatal care does not generally go unrecognized, as episodes of AKI may. Nevertheless, even given these considerations, the observational data linking preeclampsia with future CKD/ESRD does not demonstrate causation; rather, pregnancy may be considered a kidney stress test that reveals a pathophysiologic milieu that was already present. Another relevant example is gestational diabetes, an acute and temporary state of glucose intolerance during pregnancy with full recovery to normal glycemic state after the termination of pregnancy.17 Many women with gestational diabetes will eventually develop diabetes mellitus later in life, usually years or decades after the last gestational diabetes event.18 The undeniable fact that gestational diabetes precedes overt diabetes mellitus does not mean that the gestational diabetes is a cause of future diabetes mellitus; indeed, it is widely believed that pregnancy with gestational diabetes severe enough to require insulin therapy simply reveals a predisposition to diabetes and does not cause beta-cell damage or future chronic diabetes mellitus in these women. It is traditionally well known that many cases of AKI, especially those that occur in healthy children or young adults without pre-existing kidney disease, those that last for shorter periods of time, and those with ensuing normal kidney function, not only fully resolve but will also almost never lead to any subsequent chronic kidney compromise, even years to decades after the AKI event. Garg et al. recently demonstrated that severe and dialysis-requiring cases of hemolytic-uremic syndrome in children recover without detectable renal sequelae in long-term follow-up.21 Finally, an observational study of adults experiencing severe dialysis-requiring AKI found that at 5 years, 86% of patients had normal renal function.22 Even these most severe cases of AKI do not always result in ESRD, demonstrating both the considerable underlying biologic variation in AKI episodes and the lack of a reproducible biologic gradient between AKI event and CKD/ESRD outcome. These pre-existing conditions also make the individual susceptible for AKI more likely to be exposed to procedures (catheterizations using contrast agents), medications (angiotensin-converting enzyme inhibitors), and acute illnesses (sepsis) that increase the risk for AKI in and of themselves. In a recent study, Hsu and colleagues24 compared 1746 hospitalized patients who had dialysis-requiring AKI with 600,820 hospitalized patients without AKI in the Kaiser Permanente of Northern California system. The unbiased likelihood of developing AKI, derived from the adjusted odds ratios, was significantly and progressively elevated from 1.95 to 40.07 for patients with CKD stages 3 to 5 compared with patients with better kidney function (i.e., with an estimated GFR > 60 ml/min per 1.73 m2 body surface area). It may be argued that, in large studies, adjustment for these confounding variables can adequately allow for causal inference. In general, however, even the most robust multivariate adjustments are still crude and cannot fully capture the severity of the underlying illness. For example, observational studies that report that AKI is independently associated with CKD or ESRD adjust for diabetes mellitus at baseline but do not account for the severity of diabetes or the subsequent control of diabetes after the AKI episode. The difference in granularity of this critical risk factor for CKD can result in substantial misclassification in predictive models.26 Moreover, most observational studies allow all known AKI and non-AKI cases into the analysis, which can allow for biased parameter estimates. In fact, one observational study of severe dialysis-requiring AKI was unable to demonstrate an association with long-term survival despite a three-fold increase in the risk for ESRD after the episode.27 This finding may have resulted from use of propensity matching and the inability to include the percentage of the AKI patients in the analytic dataset because there was no adequate match within the control population. The ESRD and mortality risks of these patients were 100% and 40% higher, respectively, than those in the AKI cases used in the final analysis, demonstrating the tremendous amount of residual confounding that is present in observational studies. Regardless, studies demonstrating that a 0.1-mg/dl28 or 1%–24%29 change in serum creatinine from baseline to peak are independently associated with a 45% increase in ESRD or two-fold increase in the risk for CKD may reflect the ability for confounders, and not AKI (true acute tubular necrosis), to influence this association. Small changes in serum creatinine imperfectly reflect AKI.30,31 These minor changes in serum creatinine are far more likely to be a barometer of overall health than a true marker of renal injury. Furthermore, not only are the confounding variables in AKI studies difficult to adequately control, the AKI event and the outcome of CKD are also difficult to measure without bias. Most observational studies that demonstrate an association between AKI-CKD use retrospective methods and clinically available creatinine values to ascertain CKD status. However, this is a high-risk setup for ascertainment bias, in that patients who were sickest are more likely to have more health care visits and laboratory evaluation; thus, detecting an episode of CKD is more likely in the sicker patients. The choice of baseline kidney function in these studies is of critical importance;4 if outpatient progression of CKD is misdiagnosed as AKI, then the incorrect conclusion—that AKI preceded CKD—would be drawn. The use of serum creatinine to diagnose both AKI and CKD—essentially as both the exposure and the outcome—limits the ability to differentiate acute from chronic disease in a wide range of studies and settings and makes analyses of interactions between the two difficult. Although using ESRD as an outcome is more specific, relying on this outcome eliminates the possibility of investigating dose-response or understanding the magnitude of the effect of a given AKI event. In summary, more than half a million AKI events are reported each year in the United States, and most of them recover without causing long-term kidney compromise. Those without apparently normal kidney function after AKI may have had pre-existing kidney disease or other pre-existing conditions independent of the AKI-triggering factors. In many individuals, the risk factors that once predispose to an AKI event (such as metabolic syndrome, obesity, hypertension, diabetes, and cardiovascular diseases) usually continue to exist after AKI recovery and may lead to future CKD without any causal association with the prior AKI. Although it is possible that some cases of AKI are also directly or even causally related to subsequent development of CKD, no definitive method can distinguish such a putatively causal and unidirectional association between AKI and CKD from other types of associations. The likelihood of a causal relationship between an AKI and future CKD is further mitigated if the AKI recovers fast, with ensuing near-normal to normal kidney function. Prospective studies or clinical trials using more detailed assessment of kidney function with comprehensive ascertainment in patients with and those without AKI and better measures of comorbid disease severity would provide important evidence for this important question. Until then, we believe AKI is guilty only by association. K.K.Z. has served as an expert witness in legal proceedings that pertain to the role of AKI as a cause of CKD. D.E.R., S.G.C., and K.K.Z. are supported by research grants from the National Institute of Diabetes and Digestive and Kidney Diseases of the National Institutes of Health (K23-DK091521, K23-DK080132, R01-DK078106, and K24-DK091419). K.K.Z. is supported by a philanthropic grant from Mr. Harold Simmons. D.E.R. and S.G.C. contributed equally to this work. See related editorial, “Yes, AKI Truly Leads to CKD,” on pages 967–969. You are going to email the following Does AKI Truly Lead to CKD?